The Eisenhauer Team was ranked in the top 1/2 percent of real estate agents in the nation. (Berkshire Hathaway NW Real Estate 2015, 2016, 2017). Born and raised in Southwest Washington and licensed in both OR and WA, our team is dedicated to helping our clients every step of the way. We are in the business of creating a great real estate experience for every client. A large majority of our business has come from satisfied past-client referrals. Our team sells a home every 2.5 days on average! We offer state-of-the-art real estate technology, marketing strategies and support that makes for a five star experience for every client. When selecting The Eisenhauer Team, you have selected a group that is not only professional and knowledgeable in the real estate industry but is dedicated to helping you every step of the way! We strive to make ourselves available, approachable and responsive. We have more 5-star reviews on Zillow and Trulia than any other competing agent in our area – and by quite a margin. People love us on Yelp! Contact us today and give us the opportunity to earn a 5-star review from you! Actions speak louder than words. 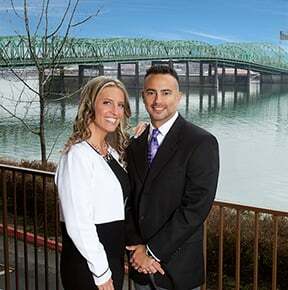 Let us prove to you that we truly are the best real estate team in the Pacific Northwest.